From MISH'S Global Economic Trend Analysis, Mish Shedlock blogs about Jobs Declining for 10th Consecutive Month. This morning, the Bureau of Labor Statistics (BLS) released the October Employment Report. Jobs were negative for a 10th straight month. 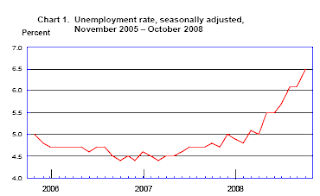 My target of 6% or higher stated unemployment by the end of the year, made in December 2007 when the unemployment rate was 4.8% was reached two months ago. In December I also predicted a jobs disaster every month this year. That prediction is now 10 for 10. Here is a synopsis of the BLS report. Nonfarm payroll employment fell by 240,000 in October, and the unemployment rate rose from 6.1 to 6.5 percent, the Bureau of Labor Statistics of the U.S. Department of Labor reported today. October's drop in payroll employment followed declines of 127,000 in August and 284,000 in September, as revised. Employment has fallen by 1.2 million in the first 10 months of 2008; over half of the decrease has occurred in the past 3 months. In October, job losses continued in manufacturing, construction, and several service-providing industries. Health care and mining continued to add jobs. A total of 132,000 goods producing jobs were lost (higher paying jobs), and for the fourth time this year service sector jobs were lost. Government, the last pace one wants to see jobs, added 23,000 jobs or the service sector would have contracted more. Note: some of the above categories overlap as shown in the preceding chart, so do not attempt to total them up. These are clearly recession totals. Once again was an extremely weak jobs report. And once again the Birth/Death Model assumptions are absurd. The birth/death adjustments have been in deep outer space every month this year except for January and July. Every month I say the same nearly the same thing. The only difference is the numbers change slightly. Here it is again: The BLS should be embarrassed to report this data. Repeating what I have been saying for months now, virtually no one can possibly believe this data. The data is so bad, I doubt those at the BLS even believe it. But that is what their model says so that is what they report. There is simply no way in a real estate crash that net new construction businesses are added. Note that are there net new professional and business services when mortgage and financial activity is collapsing. A quick check on the Mortgage Lender Implode-O-Meter shows that 300 Major US lending operations have imploded. The best thing we can say is the growth rate of mortgage lending implosions is no longer soaring. However, even if fewer lenders are going under, there is still decreasing activity in the sector and many small 1-5 person shops that have to be throwing in the towel. Those small 1-5 person businesses are not properly accounted for in the Birth-Death Model in my estimation. ADP Report Shows Contraction in Services and Small Business Jobs for more details about small business employment. ADP is the largest payroll processor in the United States. 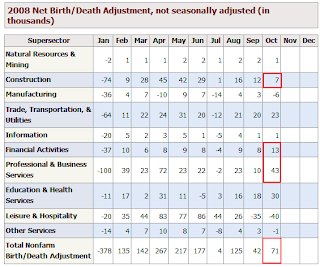 For those unfamiliar with the birth/death model, monthly jobs adjustments are made by the BLS based on economic assumptions about the birth and death of businesses (not individuals). Those assumptions are made according to estimates of where the BLS thinks we are in the economic cycle. The BLS has admitted however, that their model will be wrong at economic turning points. And there is no doubt we are long past an economic turning point. 1) The net birth/death model component figures are unique to each month and exhibit a seasonal pattern that can result in negative adjustments in some months. These models do not attempt to correct for any other potential error sources in the CES estimates such as sampling error or design limitations. 2) Note that the net birth/death figures are not seasonally adjusted, and are applied to not seasonally adjusted monthly employment links to determine the final estimate. 3) The most significant potential drawback to this or any model-based approach is that time series modeling assumes a predictable continuation of historical patterns and relationships and therefore is likely to have some difficulty producing reliable estimates at economic turning points or during periods when there are sudden changes in trend. The official unemployment rate is 6.5%. However, if you start counting all the people that want a job but gave up, all the people with part-time jobs that want a full-time job, all the people who dropped off the unemployment rolls because their unemployment benefits ran out, etc., you get a closer picture of what the unemployment rate is. That number is in the last row labeled U-6. It reflects how unemployment feels to the average Joe on the street. U-6 is 11.8%. Note that it was 8.4% a year ago. Both U-6 and U-3 (the so called "official" unemployment number) are poised to rise further. And as noted earlier, my 6% target by the end of the year for the official number was reached in August. Looking ahead, I expect the service sector to continue to weaken. Mall vacancy rates are rising and a huge contraction in commercial real estate is finally started. There is no driver for jobs and states in forced cutback mode are making matters far worse. My reaction: Mish not only does a good job of summarizing the jobs report, but also more importantly explaining the birth/death model. It is key to understand that the jobs numbers as reported are flawed, and that the employment situation is far worse than it appears.